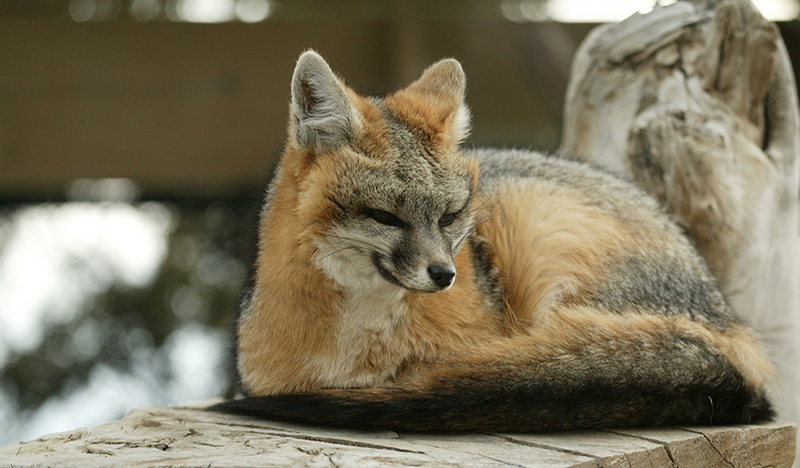 Animal Ark has housed gray foxes over the years, but does not currently have a gray fox. Common. U.S. Fish and Wildlife Service Status: Under Review. International Union for the Conservation of Nature Status: Least Concern; population stable. Gray foxes resemble small dogs with bushy tails. They are distinguished from most other canids by their grizzled upperparts, buff neck and black-tipped tail. They measure 31 to 44 inches and weigh between 8 and 15 pounds. 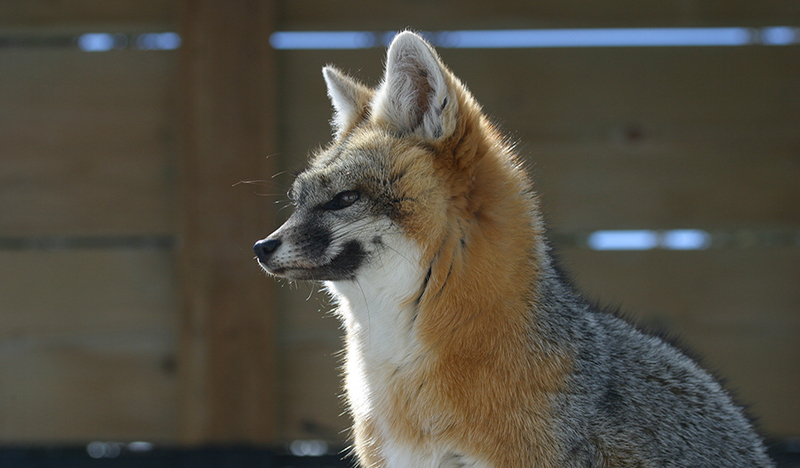 Gray foxes occur throughout most of the southern half of North America from southern Canada to northern Venezuela and Colombia. They do not occur in portions of the mountainous northwestern United States, the Great Plains and eastern Central America. They can be found in the Sierra Nevada mountains. Gray foxes are solitary hunters and eat a wide variety of food. The most important food sources for gray foxes are lagomorphs, rodents, and birds. Gray foxes supplement their diet with whatever fruits are readily available and generally eat more vegetable matter than red foxes. The breeding season of gray foxes varies geographically. In Michigan, gray foxes mate in early March; in Alabama, breeding peaks in February. Where red foxes and gray foxes occur together, gray foxes breed 2 to 4 weeks after the red foxes. Gestation lasts about 53 days, giving birth to 1-7 pups after that time. Male and female gray foxes both provide protection for their offspring. Female gray foxes nurse their young until the young are able to hunt for themselves, when they are about four months old, though will continue to care for them beyond this time. Gray foxes are relatively arboreal compared with other canids. Gray foxes are unique among canids in their ability to climb trees. They are sometimes called the Tree Fox. They have strong, hooked claws that allow them to scramble up trees to avoid predators or to get fruit. These claws are semi-retractable. Gray foxes may live 6 to 10 years in the wild but may live up to or beyond 13 in captivity.